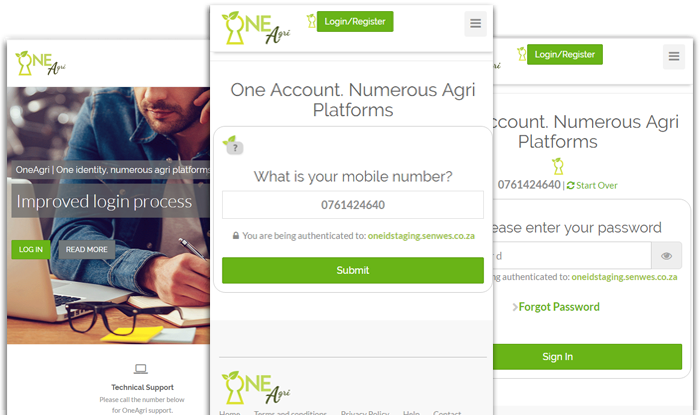 One identity, numerous agri platforms. OneAgri is a registration process where a user/client receives one identity/profile with which they can logon to different platforms of the Senwes Group. The user’s cell phone number is their key and various authorisation methods (password, PIN code, OTP) is then used in conjunction to authorise transactions, sign contracts, access market information etc. Which platforms are driven by OneAgri? Currently AgriRewards, Hinterland and Nation in Conversation make use of this convenient functionality. TradeVantage and MySenwes will soon be driven by OneAgri as well, which means that the same logon details can be used on these platforms as well. Proactively aggregate B2B initiatives before extensive channels. Monotonectally extend interactive methods of empowerment through excellent applications. Credibly administrate one-to-one e-tailers for diverse value.